Parliament hinges are perfect for those tricky door set ups that require the door to bypass an object when it’s opened, such as a pipe or wooden beam. They’re found in a variety of residential settings alongside the more common ball race hinges and are commonly used with sturdy fixtures like broad butts to ensure a precise fit and efficient operation. For more specialised fittings like our phosphor bronze washer-fitted hinges, see our diverse selection of assorted washered hinges. Or, if you need a hinge that’s water-resistant and fights off rust year-round, our hook & band hinges provide just the thing. Concerning more domestic needs, we have a large range of light duty hinges for subtle and compact yet functional applications. Similar to our cabinet hinges, these mainly involve lighter doors and frames and are suitable for indoor use, especially in the kitchen. We also stock piano hinges for effective maintenance of your piano cover, and for cast iron gates or similar heavy set ups, our collection of heavy reversible hinges provides everything you’ll ever need. 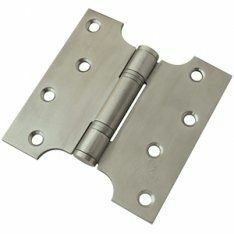 If you need something a little more resistant to thieves, try one of our spring hinges. They’re specially designed to be more difficult to force open, which makes them ideal for outside doors. For a hinge that helps distribute the weight of the door and reduces the burden on itself, see our tee hinges, and for more commercial settings where doors are operated thousands of times a day, a low-friction option like our thrust bearing hinges is best. All of our hinges are available in a selection of sizes and metal finishes for your convenience, so you can rely on Ironmongery Experts for all your construction and joinery needs.